My main interest in Noisebridge is to share knowledge by working on projects together with others. I am finding modern computer technology too complex to learn everything I need to know by working alone. I would like to make my knowledge available to others, and to learn from others by working on common projects, such as the infrastructure of Noisebridge. In addition to substantial IT skills, I can do carpentry, machining, automotive, and electrical work. I have made over 2000 edits to Wikipedia. I am also a member of HackerDojo, BioCurious, and TechShop, where I am certified to use most of the tools and equipment. The photos on the right show an exhaust fan, which I selected, configured, and installed on a laser cutter in May 2014. The laser cutter was originally delivered with a fan that was noisy and ineffective. 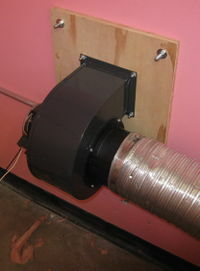 This new fan completely stopped the problem of unpleasant odors spreading through the building. The fan delivers 500 CFM at 3" static pressure. The permanent split capacitor motor turns at only 1640 RPM, leaving the fan quiet. I used smoke pellets to analyze the circulation pattern and verify smoke did not escape into the room. Note the custom-made starting collar bolted to the right side of the fan. My email address is frankbn@nym.hush.com, but email will be automatically sent to me, if you leave a message on my talk page. I suggest you communicate with me by leaving a message on my talk page. I created the "Frank" userid April 21, 2014, and this wiki page the following day. When I couldn't login on December 8, 2014, I created another userid Frankbn, which I do not use. Noisebridge is running MediaWiki version 1.9, which was supported until May 2015.
and 9,633 pages in total. There have been 180,140 edits. There are 2,598 uploaded files. This user is an Active User. This page was last edited on 11 January 2018, at 04:09.